Aig an àm seo den bhliadhna bidh sinn a’ cumail Fèill na Càisge. ‘S e fèill Chrìosdail a th‘ innte, a tha a’ còmharrachadh aiseirigh Chrìosda, ach tha iomadh nì is cleachdadh na Càisge ann air nach eil coltas Crìosdail idir – peantadh no roiligeadh uighean, ithe uain, geàrr na Càisge, caismeachdan agus bonaidean na Càisge amsaa. Cò às a thàinig na tradiseanan uile sin? Uill, tòisicheamaid leis an ainm fhèin, oir bidh sin a’ mìneachadh cuid mhath dhiubh. Tha an t-ainm Beurla, Easter, a’ tighinn (a rèir Naoimh Baeda anns an ochdamh linn) bho Ēostre, ban-dhia phaganach cheangailte ri dearg na maidne agus ris an Earrach. Bhiodh urram air a thoirt dhi mu àm a’ Ghiblein, Ēosturmanoth aig an àm seo. Mar a thachair le Saturnalia agus an Nollaig, agus le tradiseanan làidir pàganach eile, chaidh an fhèill sin fhilleadh a-steach còmhla ris a’ Chàisg, fèill Chrìosdaill aig an aon àm den bhliadhna, ach chum i feartan den t-seann fhèill Earraich – mar fhlùraichean earraich sna h-eaglaisean, no air bonaidean, agus samhlaidhean torrachais mar uighean agus uain, agus na geàrran no coineanaich òga pailt. Ach ann an cànanan eile, nam measg a’ Ghàidhlig, thàinig an t-ainm bho fhèill eile – bho “Pesach” (Passover) sa mhìosachan Iùdhach, a bhios ga chumail mu àm a’ Ghiblein cuideachd. 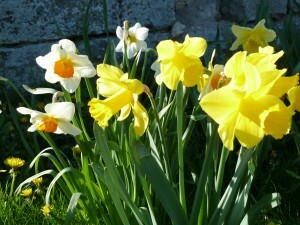 San Fhraingis ‘s e Pâques a tha oirre, san Eadailtis Pasqua, agus sa Bheurla tha am buadhair eaglaiseil paschal (m.e. paschal lamb) againn cuideachd. Anns na seann chànanan Breatannach ‘s e Pasg no Pask a bh’ oirre (Pasg sa Chuimris an-diugh), ach anns a’ Ghàidhlig dh’atharraich an fhuaim /p/ gu /q/ (bidh sinn a’ bruidhinn mu p-Ceiltis agus q-Celtis) agus an uairsin gu /k/, agus mar sin ‘s e Càisg a th’ againn sa Ghàidhlig a-nis. Le Pesach, bidh na h-Iùdhaich a’ còmharrachadh an latha nuair a shàbhail Dìa beatha nan Eabhraidheach fhad’s a chuir e a’ phlàigh mu dheireadh dha na h-Èipheitich aig àm Mhaois – bàs a’ mhic a bu shine. B’ fheudar dha na Eabhraidhich uan ìobradh agus fhuil a sgaoileadh air ursainn an dòrais mar chomharra. Mar chuimhneachan air seo bidh mòran dhiubh aig ithe uain aig àm Pesach an-diugh fhathast, ullaichte air dòigh shònraichte. Ach càit‘ a bheil na samhlaidhean Crìosdail? 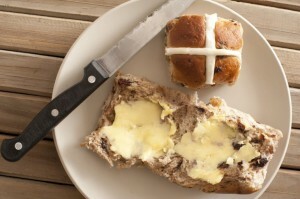 Uill, tha hot cross buns againn o chionn nam Meadhan Aoisean, leis an t-samhladh Crìosdaidheachd as ainmeile. Ach tha samhlaidhean ann a dh’fheumas barrachd mineachaidh san làtha an diugh, ‘s dòcha. Nochdaidh uighean agus uain a-rithist, mar eisimpleir. Anns an t-samhlachas Chrìosdail chithear an t-ugh mar uaigh dhùinte Chrìosda, agus briseadh an plaoisg-uighe mar an aiseirigh, briseadh smachd a’ bhàis. Thàinig uighean falamh – na bha am broinn air a shèideadh a-mach – a pheantadh agus a chleachdadh mar sgeadachadh na Càisge, do shamhladh uaigh fhalamh Chrìosda. Agus tha na h-uighean a tha gan roiligeadh le clann nan cuimhneachan air a’ chloich a chaidh a roiligeadh air falbh bhon uaigh. Tha ceangail eile eadar uighean agus a’ Chàisg. Anns an eaglais Chrìosdail thràith chan fhaoidte uighean ithe fad a’ Charghais, agus b’ fheudar an gleidheadh air dòigh air choreigin, gu tric leis a bhith gam bruich. Mar sin, bha pailteas de dh’uighean ann aig a’ Chàisg agus cothrom an ithe mu dheireadh thall, le cogais ghlan, is iad làn samhlachais Crìosdail. Agus uain na Càisge? Mar a chunnaic sinn ann an sgeul Pesach, bha an t-uan agus an fhuil aige na ìomhaigh làidir mar an ìobairt a shàbhail na h-Eabhraidhich. B’ fheudar do uain-ìobairt a bhith gun smal, agus mar sin chaidh e na samhla Chrìosda fhèin, an t-uan fìorghlan a shàbhail sinn uile. Chì sinn an ìomhaigh seo air feadh a’ Bhìobaill, bho fhàidheadaireachd Isaiah (“thugadh e mar uan a-chum a’ chasgraidh”) gu Eòin Baistidh (“Faic Uan Dhè, a tha a’ toirt air falbh peacadh an t-saoghail!”). Tha ceangal Crìosdail fiù ’s aig na caismeachdan agus na bonaidean na Càisge. B’ àbhaist do dhaoine a chaidh a bhaisteadh aig a’ Chàisg ròbaichean geala a chur orra fad na seachdain naoimh, agus do dhaoine eile an t-aodach ‘s na h-adan a b’ fheàrr aca a chur orra, agus an sagart a leantainn air caismeachd timcheall a’ bhaile no na paraiste, a’ giùlan fhlùraichean an Earraich, a’ taisbeanadh an sonas mu aiseirigh Chrìosda. Agus mar a tha nàdar na daonnachd, dh’fhaodadh dùil a bhith againn gun tionndadh seo an ceann ùine do sheòrsa taisbeanadh-fasain. Agus na coineanachan-Càisge? Bha tradisean ann sa Ghearmailt uighean sgeadaichte fhalachadh sa ghàrradh agus bhiodh a’ chlann gan lorg. Dh’innis na pàrantan dhaibh gur e ‘Geàrr na Càisge’ a bha air am breith an sin. Chaidh an tradisean seo dha na Stàitean Aonaichte còmhla ris na h-eilthirich Ghearmailteach agus bho sin gu Breatainn, gu h-àiridh ann an crùth choineanachan seòclaid. Chan eil cuimhne agam air an leithid nuair a bha mise nam phàisd; cha robh ach uigean seòclaid againne. Tha fhios, cha robh cuid de na cleachdaidhean sin air an cumail cho tric ann an Alba Chlèireach, cha robh sna h-eaglaisean fhèin co-dhiù, le fios gu leòr aig na ministearan gun robh tùs ro-Chrìosdail aig mòran dhiubh, agus blas Caitligeach air a’ chàch. Ach bha e riamh doirbh casg a chur air dibhearsainean tlachdmhor, agus mhair na cleachdaidean a dh’aindeoin uile sin, ged nach do mhair am fios mu na bha air an cùlaibh. At this time of year we celebrate Easter. It’s a Christian feast, marking the resurrection of Christ, but there are plenty of Easter customs which don’t look at at all Christian – painting and rolling eggs, eating lamb, Easter bunnies, Easter parades and bonnets and so on. Where did these traditions come from ? Well, let’s start with the name itself, as that explains a lot. 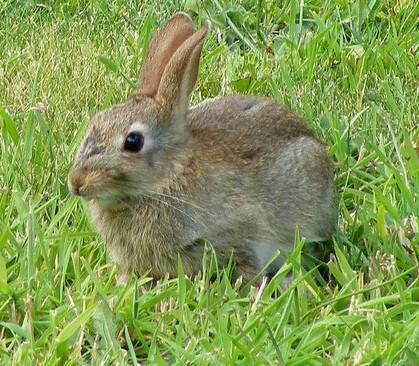 The English name, Easter, comes (according to the Venerable Bede in the 8th century) from Ēostre, a pagan goddess linked to the sunrise and Spring. She was celebrated around the month of April, called Ēosturmanoth at that time. 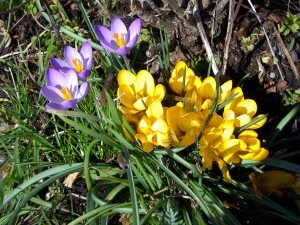 As happened with Saturnalia and Christmas, and many other persistent pagan traditions, that festival was integrated into Easter, the Christian festival at the same time of year, but it kept many features of the old spring festival – spring flowers in the churches, or on bonnets, and symbols of fertility such as eggs and lambs, and the abundant young rabbits and hares. 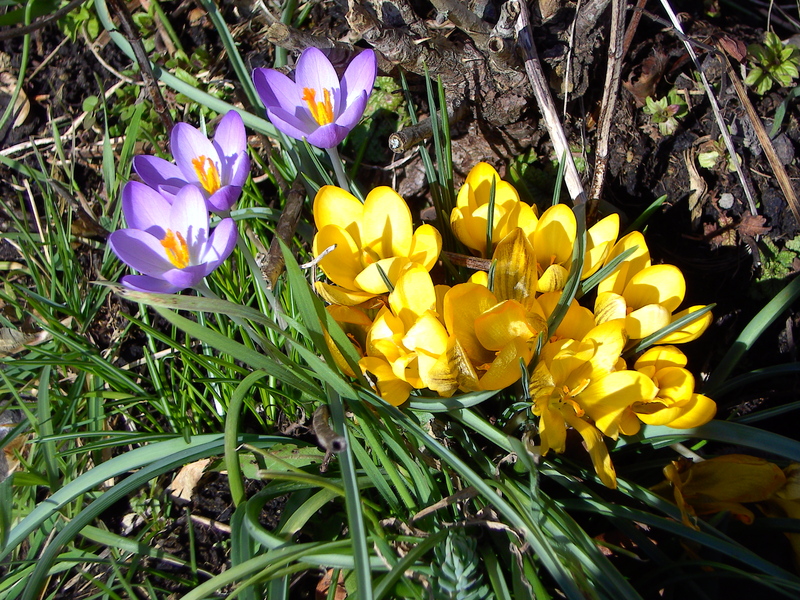 In other languages, including Gaelic (a’ Chàisg), the word for Easter came from another religious feast – from Pesach, the Passover, in the Jewish calendar, which is also held around the month of April. In French it’s Pâques, in Italian Pasqua, and in English we have the ecclesiastical adjective paschal (e.g. paschal lamb). In the old languages of Celtic Britain this was Pasg or Pask (Pasg in Welsh today), but in Gaelic the /p/ sound changed to /q/ (we talk about p-Celtic and q-Celtic) and later to /k/, giving us Càisg in Gaelic today. At Pesach Jews commemorate the day that God saved the lives of the Israelites when Moses called down God’s last plague on the Egyptians – the death of the firstborn. The Israelites had to sacrifice a lamb and spread its blood on the doorposts as a sign. In memory of this many Jews eat lamb at Pesach even today, prepared in a special way. But where are the Christian symbols? Well, we’ve had hot cross buns since the Middle Ages, with the most famous of all the symbols of Christianity, but there are some symbols that probably require a bit more explanation these days. 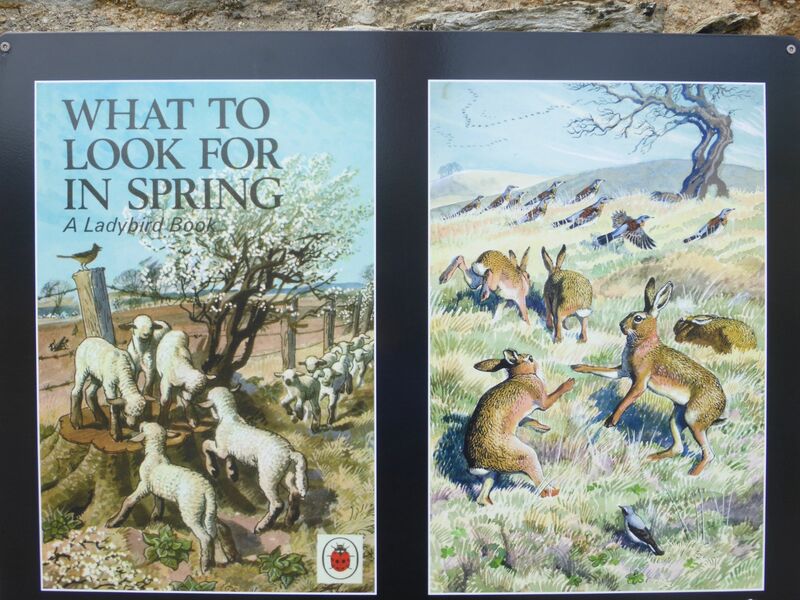 Eggs and lambs appear again, for example. In Christian symbolism the egg is seen as the sealed tomb of Christ, and the breaking of the shell as the resurrection, breaking the power of death. Empty eggs – the insides blown out through a hole – are painted and used as Easter decoration, symbolising the empty grave. 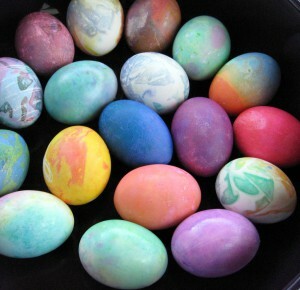 And the eggs rolled by children commemorate the rolling away of the stone from the grave mouth. There’s another link between eggs and Easter. 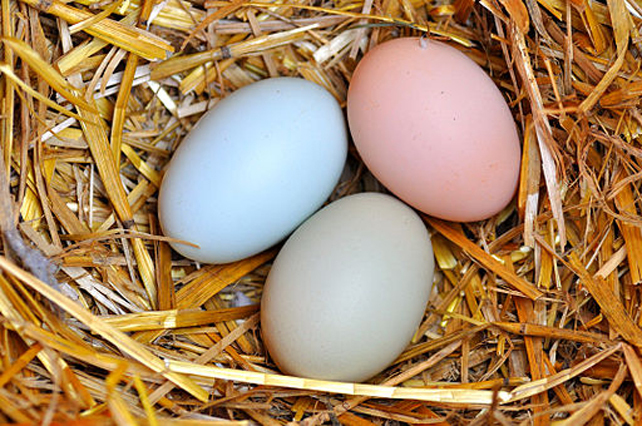 In the early Christian church it was forbidden to eat eggs during Lent and people had to preserve them in some way, often by boiling them. That meant there was an abundance of eggs available to eat at long last at Eastertime, and with a clear conscience, with all that religious symbolism attached. 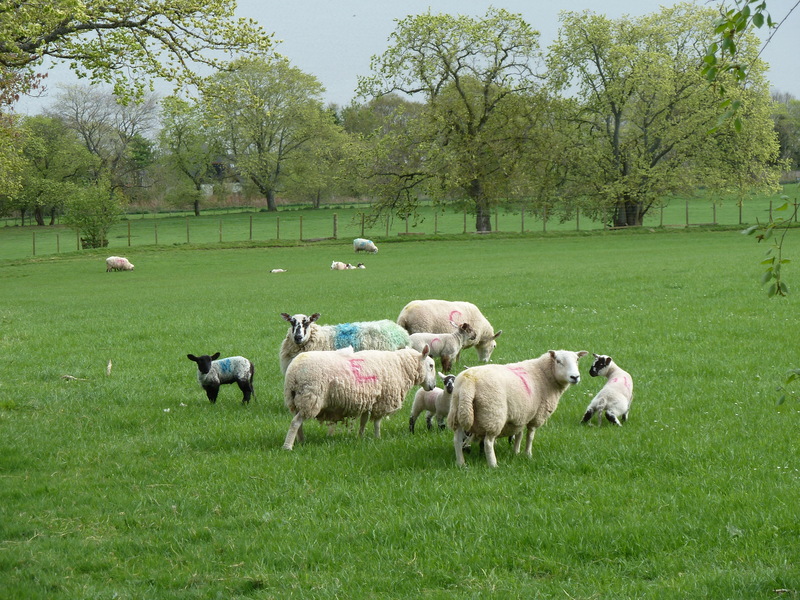 And Easter lambs? As we saw in the Pesach story, the lamb and its blood were a powerful image as the sacrifice which saved the Israelites. Sacrificial lambs had to be without blemish, and in that way it became a symbol of Christ himself, the pure lamb who would save us all. We see this image throughout the Bible, from the prophecies of Isaiah (“he is brought as a lamb to the slaughter”) to John the Baptist (“Behold the Lamb of God, which taketh away the sin of the world!”). There is even a Christian link to the Easter parades and bonnets. People who had been baptised used to wear white robes throughout the holy week, and other would put on their best clothes and hats and follow the priest in a procession around the town or parish, carrying spring flowers, showing their joy at the resurrection of Christ. Human nature being what it is, it was only to be expected that in time this would turn into a kind of fashion show. And the Easter bunnies? There was a tradition in Germany of hiding decorated eggs in the garden and the children would hunt for them. Their parents told them that the ‘Easter hare’ had laid them there. 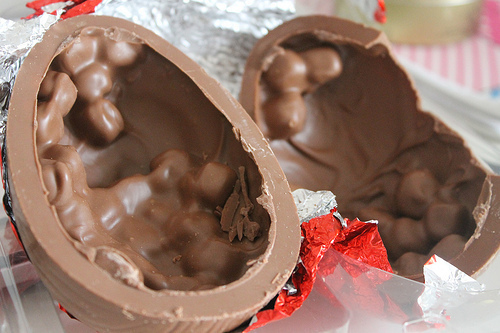 This tradition went to the United States with the German emigrants, and from there to Britain, especially in the form of chocolate rabbits. I don’t remember seeing such things when I was wee – it’s chocolate eggs that we had. Of course some of these customs were not kept in Presbyterian Scotland, or not in the churches anyway, as the ministers knew quite well that many of them had pre-Christian origins, and the rest smacked of Catholicism. But it’s always been difficult to put a stop to people’s pleasure and enjoyment, and the traditions persisted despite that, even if the knowledge of what was behind them was forgotten. Creative Commons photos as indicated, with thanks. All other photos my own.